Juicing without a juicer. Is it possible? The answer isn’t all that straightforward, but it’s a question that’s often asked. The concept of juicing without a juicer probably appeals to at least some of you. Juicing is getting plenty of buzz nowadays (rightfully so! ), and a significant number of people are starting to learn about its benefits. The advantages of juicing are intriguing, and it's great to start enjoying your own freshly prepared fruit and vegetable juices. It only makes sense – juicing produces delicious, refreshing, all-natural beverages that offer a number of health benefits. Many people who’d like to start juicing don’t own their own juicer. Why would they? They’re just starting out. They want to know if buying one would be required. That's understandable. And some people just don’t have the extra counter space in their kitchen, even for an appliance as useful and healthy as a juicer. Others might want an alternative that can help them decide whether they’re interested in juicing over the long term or it’s something they’ll soon lose interest in. In truth, a juicer is indispensable for creating the real juices. If you want all the benefits of fruit and vegetable juicing and you’re committed for the long haul, sooner or later you’ll need a juicer. But, if you just want to squeeze your own fresh orange or other citrus juice, you can probably “make do” without a juicer. You won’t really be juicing – but you will be able to produce as much fresh, wholesome citrus juice as you want without incurring the price of a juicer. It’s pretty easy to squeeze the juice out of oranges and other citrus fruits by hand. You can use an inexpensive, hand-held wooden, aluminum or plastic reamer, a hinged squeezer, or a more upscale hand press to get the juice out of citrus fruits. All these devices are fairly efficient and easy to use with citrus fruits. Unfortunately, they simply won’t work with vegetables and non-citrus fruits. An electric juicer will. Juicers can extract the juice from tomatoes, melons, carrots, lettuce and a wide assortment of other produce, plus they extract citrus juice much more efficiently than any hand-held manual device. A juicer will also ensure that you get the full benefit of all the vitamins, minerals, fiber and other wholesome constituents of the fruits and vegetables. However, there’s another option for “juicing” vegetables and non-citrus fruits. If you don’t have a juicer, consider using an ordinary kitchen blender or food processor to start juicing without a juicer. Technically speaking, you’re not juicing when you’re making fresh fruit and vegetable juices with a blender or food processor, but it can give you some of the same benefits without requiring you to buy a true juicer. A blender can work well if you like thick, fibrous juices or you begin with high water-content fruits – watermelon, for example. Peel your produce and chop it into small pieces. Place the pieces inside your blender’s carafe or your food processor’s bowl. Turn on the machine and blend your produce to within an inch of its life, then strain using a fine-meshed sieve or strainer. Discard the pulp and refrigerate the juice promptly. Drink your juice fairly quickly. 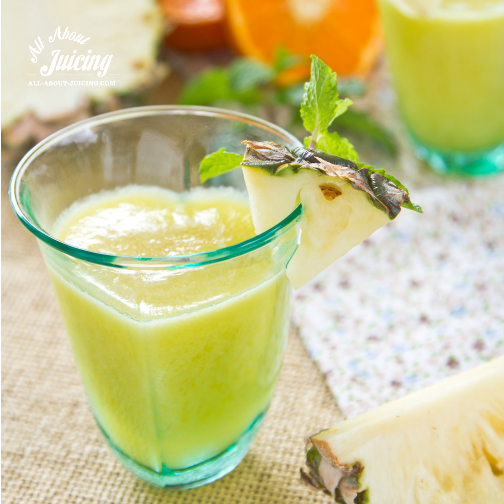 Juice made in a blender or food processor will lose its freshness faster than juice that’s been extracted by a juicer. That’s because a blender or food processor introduces more oxygen into the juice than a true juicer. So, although juicing without a juicer isn’t possible (technically speaking), by using one or two workarounds you can still get some of the benefits of fresh, raw fruit and vegetable juices. Hand-held reamers, hinged squeezers and the like work well with citrus, but for other types of produce you’ll need to use a juicer, blender or food processor. If you really want to take advantage of all of the benefits of juicing, you’ll need to buy and use a true juicer. But if your budget is limited, you’re short on counter space, or you’re just exploring the possibilities and you want to make sure you’ll stick with juicing before you invest in a juicer, these devices can work well in the short run. They’ll give you a little taste of what you’ll experience if you buy a true juicer. Try watermelon juice or a plain tomato juice for starters.